The 'Thousand Mountains' region is a series of verdent valleys and small plains nestled among towering peaks. No nation is able to claim ownership of the remote region, leaving the area mostly unsettled. The few towns and communties spotted through out the area live quietly, trading periodically with the far away cities. Greenvale – a quiet town nestled in a particularly verdant valley, with a population of 1300, composed of nearly all races. The valley is surrounded by various points of interest for adventurers as well as being not too far off from oft used trade routes. Population: 1300; with another 200 living in the surrounding area. 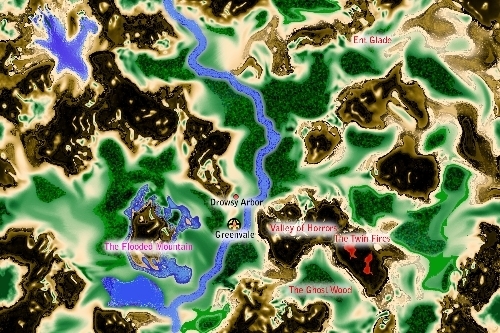 Most of Greenvale’s residents are Humans, Elves and Halflings, with Dwarves being very common. It is also home to a small population of Eladrin as well. Dragonborn and Tieflings in Greenvale are typically travelers passing through. The Drowsy Arbor – Once a Tiefling monastery, this single building built atop a hill has been converted into an inn/rest stop for travelers. Located just outside of the small town of Greenvale, the owner/proprietor is a brawny half elf named Grindol. Grindol was raised in a nearby Dwarven community, after his parents and village was overrun by Gnoll Marauders. After a brief adventuring career, he bought ‘the Arbor’ and settled down with his wife (Messinda, an Elf Warlock) to raise a family. The Drowsy Arbor itself is a sole building built into a large round hill. The main floor consists of a large taproom and a kitchen. Upstairs are two floors that house Grindol and his family, while below the taproom (built down into the hill) are two floors of rooms for guests to stay. Most of the rooms for guests have small windows that look out the North side of the hill. Flooded Mountain – A lone, but gargantuan mountain sits, surrounded by water, almost like a natural moat. Rumors say that the mountain itself is filled with water and if cracked open it would flood the valley. These rumors are kept alive by the many natural (supernatural?) springs that well up and trickle down the slopes. Valley of Horrors – this winding valley is a veritable crack in the mountains and its walls are dotted with a multitude of caves and crevasses. Here many creatures, natural and aberration, make their homes. *Think ‘Caves of Chaos’ from Keep on the Borderlands. Ent Glade – Little is known of this remote clearing amongst the wood valleys. Tales tell that this stretch of meadow is where the Ents convene on nights when the moons are full. Some people say that the Ents will give counsel to those who come with questions of great importance, or gifts. The Twin Fires – This dual volcano is said to house the forges of a Fire Titan lord, named Azgarrott. People whisper that when great gouts of flame jet from these, the Titan lord crafts his magic arms and armor. Whether this is true or not, fires can often be seen bursting forth from the mouths of these volcanoes, with no discernable pattern or reason. On clear nights, the locals also say that you can hear the giants feasting in their halls. The Ghost Wood – Dark and foreboding, this forest of twisted and cursed trees is obviously no place for the sane to visit. Nestled in a valley, sitting in the shadow of the Twin Fires, it is no wonder why people say this wood is haunted. Spectral figures move between the black, gnarled trunks and the thick canopy of dark leaves blots out the sun. If this does not deter visitors, then the monstrous webs that clot the pathways should…. Laric's Gate - Far to the South, at the Anoc Falls, the Na-Duhr river tumbles down in to the Yusan jungles. At these falls is the city of Laric's Gate. 1. These "moon gates", for lack of a better term, are completely lifted from the Ultima game series created by 'Lord British' and Origin Systems. Why let such great ideas fade to obscurity?